Writing these pages was an interesting experience: My sister had sent me a CD with her pictures as well as her own diary of the days (in German though). I don't know much (if anything) about horses and riding, only the little I've picked up from my sister talking about it. Meaning I had to write about something I don't know much about (apart from the landscape) and "translate" my sisters notes while trying to make it sound interesting and written by herself. I think I've been reasonably successful, my sister says she's happy with it. I hope you'll enjoy the pages as well. If you have any questions or comments for my sister feel free to e-mail me and I'll forward it to her. 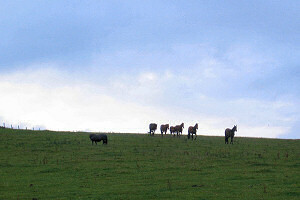 I'll close this posting with some more "horse content", a few horses in the early morning light at Homeston Farm. This picture was taken on their rest day (at least I assume they get a rest between the current guests leaving and the new guests arriving), or the day my sister and me drove on to Islay. Which leads me on quite nicely to the next pages I will be able to plug: I'll now start working on the pages from our days on Islay and Colonsay. I'll also try to squeeze in some other blogging though. I've got a few links I still want to blog about. Just wait and see.